"Megami" redirects here. For other uses, see Megami (disambiguation) and Kami (disambiguation). Though the word kami is translated multiple ways into English, no one English word expresses its full meaning. The ambiguity of the meaning of kami is necessary, as it conveys the ambiguous nature of kami themselves. Kami is the Japanese word for a god, deity, divinity, or spirit. It has been used to describe mind (心霊), God (ゴッド), supreme being (至上者), one of the Shinto deities, an effigy, a principle, and anything that is worshipped. Although deity is the common interpretation of kami, some Shinto scholars argue that such a translation can cause a misunderstanding of the term. [page needed] The wide variety of usage of the word kami can be compared to the Sanskrit Deva and the Hebrew Elohim, which also refer to God, gods, angels, or spirits. Kami may, at its root, simply mean spirit, or an aspect of spirituality. It is written with the kanji 神, Sino-Japanese reading shin or jin. In Chinese, the character means deity. In the Ainu language, the word kamuy refers to an animistic concept very similar to Japanese kami. The matter of the words' origins is still a subject of debate; several hypotheses about their similarities exist: the Japanese word was borrowed from the Jōmon/Ainu language, or are cognates of an extremely distant common ancestor. In his Kojiki-den, Motoori Norinaga gave a definition of kami: "...any being whatsoever which possesses some eminent quality out of the ordinary, and is awe-inspiring, is called kami." Gender is also not implied in the word kami, and as such it can be used to refer to either male or female. The word megami (女神), the use of female kami is a fairly new tradition. 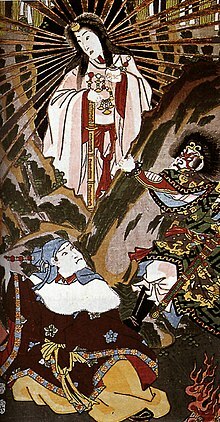 There is a strong tradition of myth-histories in the Shinto faith; one such myth details the appearance of the first emperor, grandson of the Sun Goddess Amaterasu. In this myth, when Amaterasu sent her grandson to earth to rule, she gave him five rice grains, which had been grown in the fields of heaven (Takamagahara). This rice made it possible for him to transform the "wilderness". Social and political strife have played a key role in the development of new sorts of kami, specifically the goryo-shin (the sacred spirit kami). The goryo are the vengeful spirits of the dead whose lives were cut short, but they were calmed by the devotion of Shinto followers and are now believed to punish those who do not honor the kami. The pantheon of kami, like the kami themselves, is forever changing in definition and scope. As the needs of the people have shifted, so too have the domains and roles of the various kami. Some examples of this are related to health, such as the kami of smallpox whose role was expanded to include all contagious diseases, or the kami of boils and growths who has also come to preside over cancers and cancer treatments. In the ancient animistic religions, kami were understood as simply the divine forces of nature. Worshippers in ancient Japan revered creations of nature which exhibited a particular beauty and power such as waterfalls, mountains, boulders, animals, trees, grasses, and even rice paddies. They strongly believed the spirits or resident kami deserved respect. In 927 CE, the Engi-shiki (延喜式, literally, Procedures of the Engi Era) was promulgated in fifty volumes. This, the first formal codification of Shinto rites and norito (liturgies and prayers) to survive, became the basis for all subsequent Shinto liturgical practice and efforts. It listed all of the 2,861 Shinto shrines existing at the time, and the 3,131 official-recognized and enshrined kami. The number of kami has grown and far exceeded this figure through the following generations as there are over 2,446,000 individual kami enshrined in Tokyo's Yasukuni Shrine alone. Kami are the central objects of worship for the Shinto faith. The ancient animistic spirituality of Japan was the beginning of modern Shinto, which became a formal spiritual institution later, in an effort to preserve the traditional beliefs from the encroachment of imported religious ideas. As a result, the nature of what can be called kami is very general and encompasses many different concepts and phenomena. There are other spirits designated as kami as well. For example, the guardian spirits of the land, occupations, and skills; spirits of Japanese heroes, men of outstanding deeds or virtues, and those who have contributed to civilization, culture, and human welfare; those who have died for the state or the community; and the pitiable dead. Not only spirits superior to man can be considered kami; spirits that are considered pitiable or weak have also been considered kami in Shinto. Although the ancient designations are still adhered to, in modern Shinto many priests also consider kami to be anthropomorphic spirits, with nobility and authority. One such example is the mythological figure Amaterasu-ōmikami, the sun goddess of the Shinto pantheon. Although these kami can be considered deities, they are not necessarily considered omnipotent or omniscient, and like the Greek Gods, they had flawed personalities and were quite capable of ignoble acts. In the myths of Amaterasu, for example, she could see the events of the human world, but had to use divination rituals to see the future. The ancestors of a particular family can also be worshipped as kami. In this sense, these kami are worshipped not because of their godly powers, but because of a distinctive quality or virtue. These kami are celebrated regionally, and several miniature shrines (hokora) have been built in their honor. In many cases, people who once lived are thus revered; an example of this is Tenjin, who was Sugawara no Michizane (845-903 CE) in life. Within Shinto it is believed that the nature of life is sacred, because the kami began human life. Yet people cannot perceive this divine nature, which the kami created, on their own; therefore, magokoro, or purification, is necessary in order to see the divine nature. [unreliable source] This purification can only be granted by the kami. In order to please the kami and earn magokoro, Shinto followers are taught to uphold the four affirmations of Shinto. The first affirmation is to hold fast to tradition and the family. Family is seen as the main mechanism by which traditions are preserved. For instance, in marriage or birth, tradition is potentially observed and passed onto future generations. The second affirmation is to have a love of nature. Nature objects are worshipped as sacred, because the kami inhabit them. Therefore, to be in contact with nature means to be in contact with the gods. The third affirmation is to maintain physical cleanliness. Followers of Shinto take baths, wash their hands, and rinse out their mouths often. The last affirmation is to practice matsuri, which is the worship and honor given to the kami and ancestral spirits. Shinto followers also believe that the kami are the ones who can either grant blessings or curses to a person. Shinto believers desire to appease the evil kami to "stay on their good side", and also to please the good kami. In addition to practicing the four affirmations daily, Shinto believers also wear omamori to aid them in remaining pure and protected. Mamori are charms that keep the evil kami from striking a human with sickness or causing disaster to befall them. One of the first recorded rituals we know of is Niiname-sai, the ceremony in which the Emperor offers newly harvested rice to the kami to secure their blessing for a bountiful harvest. A yearly festival, Niiname-sai is also performed when a new Emperor comes to power, in which case it is called Onamesai. In the ceremony the Emperor offers crops from the new harvest to the kami, including rice, fish, fruits, soup, and stew. The Emperor first feasts with the deities, then the guests. The feast could go on for some time; for example, the Showa Emperor's feast spanned two days. Itsukushima Shinto Shrine, Miyajima Island, Hiroshima Prefecture, Japan. This shrine is believed to be where the kami dwell, and hosts many ceremonies and festivals. Ascetic practices, shrine rituals and ceremonies, and Japanese festivals are the most public ways that Shinto devotees celebrate and offer adoration for the kami. Kami are celebrated during their distinct festivals that usually take place at the shrines dedicated to their worship. Many festivals involve believers, who are usually intoxicated, parading, sometimes running, toward the shrine while carrying mikoshi (portable shrines) as the community gathers for the festival ceremony. Yamamoto Guji, the high priest at the Tsubaki Grand Shrine, explains that this practice honors the kami because "it is in the festival, the matsuri, the greatest celebration of life can be seen in the world of Shinto and it is the people of the community who attend festivals as groups, as a whole village who are seeking to unlock the human potential as children of kami." During the New Year Festival, families purify and clean their houses in preparation for the upcoming year. Offerings are also made to the ancestors so that they will bless the family in the future year. Shinto ceremonies are so long and complex that in some shrines it can take ten years for the priests to learn them. The priesthood was traditionally hereditary. Some shrines have drawn their priests from the same families for over a hundred generations. It is not uncommon for the clergy to be female priestesses. The priests may be assisted by miko, young unmarried women acting as shrine maidens. Neither priests nor priestesses live as ascetics; in fact, it is common for them to be married, and they are not traditionally expected to meditate. Rather, they are considered specialists in the arts of maintaining the connection between the kami and the people. Many other rites of passage are practiced by Shinto believers, and there are also many other festivals. The main reason for these ceremonies is so that Shinto followers can appease the kami in order to reach magokoro. :205 Magokoro can only be received through the kami. Ceremonies and festivals are long and complex because they need to be perfect to satisfy the kami. If the kami are not pleased with these ceremonies, they will not grant a Shinto believer magokoro. ^ Tamura, Yoshiro (2000). Japanese Buddhism: A Cultural History (1st ed.). Tokyo: Kosei Publishing. ISBN 4333016843. ^ a b c Boyd, James W.; Williams, Ron G. (1 January 2005). "Japanese Shintō: An Interpretation of a Priestly Perspective". Philosophy East and West. 55 (1): 33–63. doi:10.1353/pew.2004.0039. JSTOR 4487935. ^ a b c d e f g h Yamakage, Motohisa; Gillespie, Mineko S.; Gillespie, Gerald L.; Komuro, Yoshitsugu; Leeuw, Paul de; Rankin, Aidan (2007). The Essence of Shinto: Japan's Spiritual Heart (1st ed.). Tokyo: Kodansha International. ISBN 4770030444. ^ "Kanji details - Denshi Jisho". 3 July 2013. Archived from the original on 3 July 2013. Retrieved 2 May 2017. ^ Holtom, D. C. (January 1940). "The Meaning of Kami. Chapter I. Japanese Derivations". Monumenta Nipponica. 3 (1): 1–27. doi:10.2307/2382402. JSTOR 2382402. ^ Ono, Sokyo; Woodard, William P. (2004). Shinto, the Kami Way (1st ed.). Boston, Massachusetts: C.E. Tuttle. ISBN 9780804835572. ^ "神 - Yahoo奇摩字典 搜尋結果". Yahoo Dictionary. 1 January 2013. Retrieved 1 January 2017. ^ Nonno, Tresi (2015). "On Ainu etymology of key concepts of Shintō: tamashii and kami" (PDF). Cultural Anthropology and Ethnosemiotics. 1 (1): 24–35. Retrieved 5 June 2016. ^ Gall, Robert S. (January 1999). "Kami and Daimon: A Cross-Cultural Reflection on What Is Divine". Philosophy East and West. 49 (1): 63–74. doi:10.2307/1400117. JSTOR 1400117. ^ a b Jones, Lindsay (2005). Encyclopedia of Religion (2nd ed.). New York: Macmillan [u.a.] pp. 5071–5074. ISBN 9780028657349. ^ a b c d e f Ohnuki-Tierney, Emiko (July 1991). "The Emperor of Japan as Deity (Kami)". Ethnology. 30 (3): 199–215. doi:10.2307/3773631. JSTOR 3773631. ^ Picken, Stuart D.B. (2011). Historical Dictionary of Shinto (2nd ed.). Lanham: Rowman & Littlefield Publishing Group. p. 92. ISBN 0810873729. ^ "Deities". Yasukuni Shrine. Retrieved 29 June 2016. ^ a b c "Shinto". ReligionFacts. 17 November 2016. Retrieved 1 January 2017. ^ a b Halverson, Dean C. (1996). The Compact Guide to World Religions. Minneapolis, Minnesota: Bethany House Publishers. p. 205. ISBN 1556617046. ^ Hopfe, Lewis M.; Woodward, Mark R. (2009). Religions of the World (11th ed.). New York: Vango Books. ISBN 013606177X. ^ "Shintō - Ritual practices and institutions". Encyclopedia Britannica. Retrieved 26 November 2018. ^ a b c d Editors, The (20 July 1998). "Shinshoku". Encyclopedia Britannica. Retrieved 1 January 2017. ^ "Shinto - The Way Of The Gods". Archived from the original on 30 July 2013. Retrieved 2 May 2017. ^ "SHINTO". Religious Tolerance. Retrieved 1 January 2017. Chamberlain, Basil H. (translated by). 1919. The Kojiki, Records of Ancient Matters. Asiatic Society of Japan. Clarke, Roger. 2000. "What are the little monsters up to?". The Independent. 7 April 2000. Fisher, Mary P. 2008. Living Religions seventh edition. Look up kami or megami in Wiktionary, the free dictionary. This page was last edited on 15 April 2019, at 18:21 (UTC).